Hello Heroclix’ers! I trust the weekend went well and everybody had a great holiday! After that last preview, I had to relocate to some new digs and who better to help me find a new office than “Bobo T. Chmipanzee”, the Detective Chimp? As you can see, Bobo has come a long way from the carnival and he’s made quite a name for himself as a master of deductive reasoning. 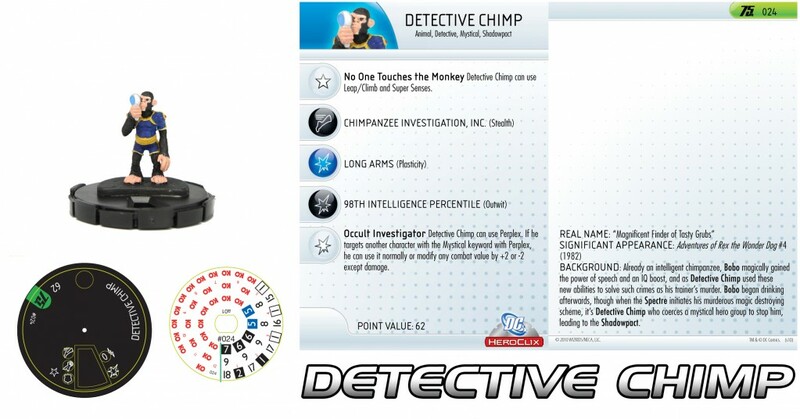 His early dial Outwit and Occult Investigator Special Powers are wonderful representations of his cognitive abilities while his Trait (“No One Touches the Monkey”) shows off his physical prowess and keeps Detective Chimp mobile and hard to hit. Combine that with some early dial Stealth and you have a great addition to your Shadowpact, Mystical, Animal, or (my personal fave) Detective Theme teams! Detective Chimp may be small, but he brings a potent arsenal of support abilities and potential! That’s all we have for today, but join us later in the week as we pay a little visit to the Empire of Tears. In the meantime, keep those figures off their K.O. clix!